The first services were held on March 16, 1958 in the home of Rev. and Mrs. James W. Cummins, at 401 Edgewood Drive in Sellersburg, Indiana. This first meeting was attended by twelve people. On April 25, 1958, founding Pastor James Cummins then purchased the local theater building and the church first worshipped in the theater building on Mother’s Day, May 11, 1958 with 35 in Sunday School and 36 in Worship. Land was purchased for a building on Highway 311 in May 1960. A traditional Worship Center with a basement fellowship hall and Sunday School rooms were soon built and dedicated to the Glory of the Lord on June 3, 1961. In May of 1966 ground was broken for a new educational building to be attached to the rear of the Worship Center. This building consisted of Sunday School rooms and offices. This building was dedicated in July 1967. 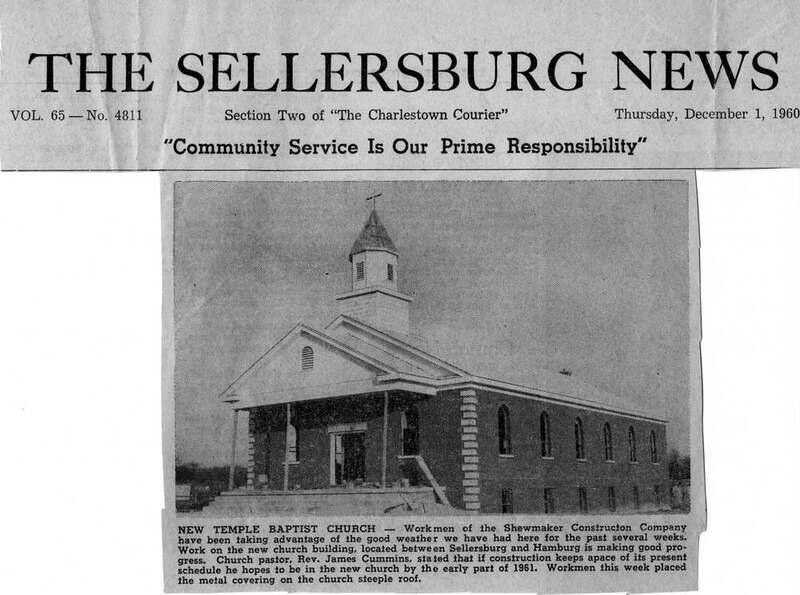 Additionally, a formal vote was taken to change the name to First Baptist Church of Sellersburg, Indiana. During The Scrivner era the church began an aggressive bus ministry and saw several hundred children come to the church on a weekly basis and many hundreds were lead to the Lord during his ministry. Due the numerical growth during these years the church voted to build a multipurpose building behind the educational building. This building was named in honor of pastor Cummins when dedicated in the Spring of 1974. Brother Scrivner served as President of SCBI while Pastor of First Baptist Church. Brother Scrivner left in 1975 and the church called their former Director of Missions Dr. Presley Morris back from South Carolina to lead the church. Presley Morris had served the Southeastern Association as DOM and was a member of First Baptist for part of his time in Indiana. During the Morris’ era the church saw a continued emphasis on evangelism and had to retool the bus ministry because of the oil crisis. Presley Morris left the Church in 1978 and returned to the family farm and business in South Carolina where he has also pastored ever since. Currently, (September 2008) Brother Morris is 81 and has just celebrated 18 years as Pastor of the New Hope Baptist Church near Manning, South Carolina. Following Brother Morris' departure, the church called Dr. Charles Mitchiner as interim pastor. Brother Mitchiner had just retired after serving a lengthy pastorate in Louisville. He served as interim for about 18 months and then was called as Pastor. He retired, for health reasons on January 1, 1981. He actually served longer as interim Pastor than as Pastor. Brother Mitchiner went home to be with the Lord soon after leaving First Baptist. The Church then turned to the Southern Seminary and found a young student, Tom Brown, to serve as their Pastor. Tom served while working on his seminary degrees. Tom and His wife Janie had three children while serving as First Baptist Church. Tom accepted the call to the James Island Baptist Church near James Island, South Carolina in the fall of 1985. Tom still serves that church today. Doug Davis was called as Pastor of the First Baptist Church in early 1986. Doug served the church longer than any other Pastor in our history. During Brother Doug’s leadership significant remodeling and new ministries occurred. Brother Doug served until October 1998. Doug is currently serving as the Pastor of the Perryville Baptist Church in Perryville, Kentucky. Following Brother Davis’ work at First Baptist, the church called Dr. Jim Hamilton as Pastor. Jim served until October 2003 when he was called as the Executive Director of the Dakota Baptist Convention. Dr. Hamilton led the church to remodel the Cummins building and convert it into a multi purpose worship center. Jim Hamilton served as President of the SCBI while serving as Pastor at First Baptist. In February 2005 Steve Davidson was called as Pastor of the First Baptist Church. In 2006 the church dedicated the Education building in honor of Mrs. Opal Huffman on her forty years of service as church secretary. Pastor Davidson served on the State Convention’s Executive Board, serving nearly three years as Chairman. The Church has always had a heart for missions: helping to start a mission in North Vernon and the Pearl Mission of New Albany. In 1959 the church began giving to the Lottie Moon Offering, receiving $76.54. Last year the church gave $9,542.00. First Baptist has been blessed through the years with many part-time and full-time staff members. Also, First Baptist Church has had many members called, licensed or ordained to the ministry while at FBC: Steve Faith, John Rogers, Rick Smith, Bob Sattlefield, Jim Bullock, Ron Parris, Don Hinton, Garry Bledsoe, Tony Nokes, Andrew Hendon, Donnie Settles, Tony Kummer, Jimmy Bledsoe, Matthew Walton, and Mike Conley.